After fussing with other tension-mounted adjustable baby gates one time too many, and feeling that any additional hassles with them might result in Grace learning some bad words, I took the plunge and ordered the same baby gate that works so well at our church nursery: the First Years Hands-Free baby gate. I have not been sorry one bit! Now, at around $50 it isn’t the cheapest baby gate, but I do think it’s one of the best. I was a bit leery that, because it doesn’t have permanent hardware mounted into the wall, it might be a bit rickety or hard to install. Not so! My husband installed it in minutes, and it has stayed secure in spite of Grace’s repeated attempts to yank it down. Also, even though Grace has managed to figure out that the foot pedal is the key to opening the gate, even when standing on it with both feet and jumping up and down, she is unable to get enough force with her 25+ lb. frame to open the gate. And, as I said above, I’ve seen it in action for a couple of years now at our church nursery, and none of the children have managed to either bring down the gate or open it. 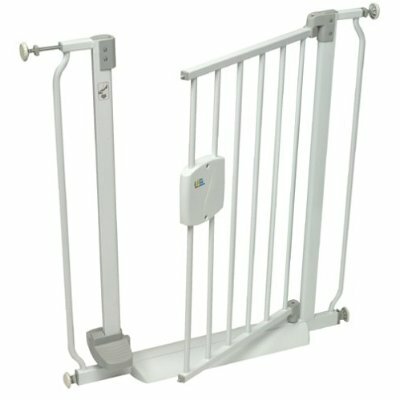 This gate will help you feel that your baby is safe and secure… which is worth every penny in my book!